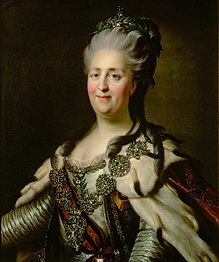 Katẹrínì Kejì (Catherine II) (Rọ́síà: Екатерина II Великая, Yekaterina II Velikaya), also known as Katẹrínì Eninla (Jẹ́mánì: Katharina die Große), je bibi ni Stettin, Pomerania, Jemani ni 2 May [O.S. 21 April] 1729 bi Sophie Friederike Auguste von Anhalt-Zerbst-Dornburg. O je bi Ayabaluaye ile Rosia lati 9 July [O.S. 28 June] 1762 leyin idotefikupa oko re, Peter 3k, leyin opin Ogun Odun Meje titi di ojo iku re ni 17 November [O.S. 6 November] 1796. Under her direct auspices the Russian Empire expanded, improved its administration, and continued to modernize along Western European lines. Catherine's rule re-vitalized Russia, which grew stronger than ever and became recognized as one of the great powers of Europe. She had successes in foreign policy and oversaw sometimes brutal reprisals in the wake of rebellion (most notably Pugachev's Rebellion). Àtunṣe ojúewé yi gbẹ̀yìn wáyé ni ọjọ́ 25 Oṣù Kàrún 2015, ni ago 11:27.